Hikers have created a fanciful face, complete with eyes, nose, teeth and a tongue on this rack that had split apart. Coppertone and I had planned on hiking through Emerald Bay and D. L. Bliss State Park to complete the Rubicon Trail. Guides had given us the impression that the distance between them was not that great. In the end we never made it out of Emerald Bay State Park but we had a great day of it anyway. Driving down Highway 89 we passed the mayhem of the mass of humanity trying to park at the Emerald Bay Overlook for the shortest route down to Vikingsholm. We continued on towards the main entrance into Emerald Bay State Park and found a large parking lot for the trailhead that was mostly empty. Yes, one would have to put in some miles from this starting point, but we were here to hike! The trail hugging the slope overlooking Emerald Bay to the north is very pleasant and well maintained. It does not take long before one is afforded nice views of the water and eventually Fannette Island, the only island in Lake Tahoe, as well. Several snags dotted the area, many featuring large nests at the topmost point. One of them sported what appeared to be a Osprey adult feeding their young. We waited some time to watch the bird take flight, but they had a different time schedule than we did. Shortly before reaching the very busy area around Vikingsholm we traversed part of the rock fall associated with a rockslide that occurred in 1955. During our trip back up the trail we spotted the mangled wreck of a pickup truck amongst the boulders and could not help but wonder whether it had slide down with these boulders in 1955 or whether it had flown off the highway at a later date. The solitude for this hike takes a nosedive near the Eagle Creek crossing. The bridge over the creek provides an enjoyable view of tumbling water itself. However, taking the Lower Eagle Falls spur about a quarter mile uphill boasts of a view far more impressive. We wander into the area around the historic Vikingsholm and its surrounding buildings and it feels like the height of summer. People are everywhere. We make a judgement to abandon our original plans to head all of the way to D. L. Bliss State Park and buy tickets for a tour of Vikingsholm. After the tour we do continue down the Rubicon Trail to the viewpoint of Parson Rock. Then we doubled back to our car and called it a day. Top Trails Lake Tahoe explores the best trails for hiking and biking in the Tahoe area, including the north side's splendid backcountry, the lake’s sedate western side, the picturesque and popular areas south of the lake, including Desolation Wilderness and D. L. Bliss and Emerald Bay state parks and the relatively undeveloped eastern side. 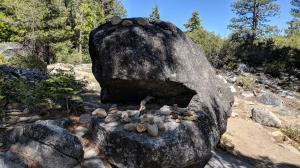 Several hikes follow sections of the Tahoe Rim Trail and Pacific Crest Trail. Veteran author Mike White has selected the 50 best trips in the area, ranging in length from a mile-long stroll through a lush, lodgepole-lined meadow to a 19-mile trek on the Tahoe Rim Trail with excellent lake views. The second edition includes six new trails.Winner of the Benjamin Franklin Award for travel guides.